[Cambridge, UK; 2 July 2014] Following the recent announcement of the Android L Developer Preview supporting the 64-bit ARMv8-A architecture, Linaro, the collaborative engineering organization developing open source software for the ARM architecture, today announced that a port of the Android Open Source Project (AOSP) to the ARMv8-A architecture has been made available as part of the Linaro 14.06 release. 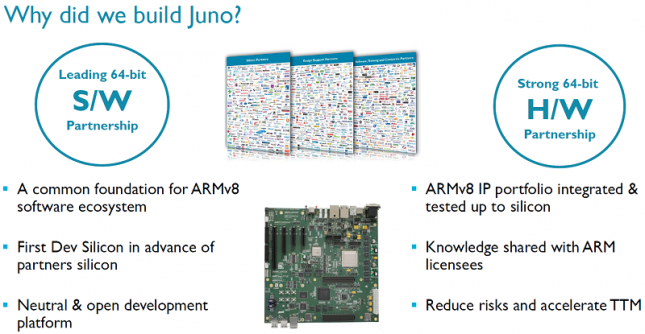 This port has been tested on an ARMv8-A 64-bit hardware development platform, code-named “Juno”, available from ARM for lead and ecosystem partners. 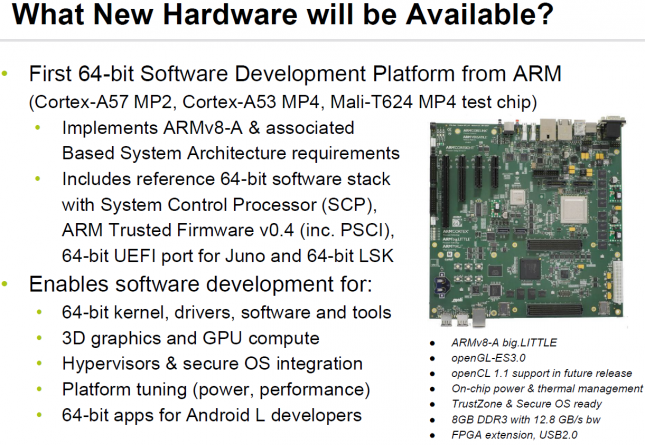 The Linaro ARMv8-A reference software stack combined with the ARM Development Platform (ADP) provides the ARM ecosystem with a foundation to accelerate 64-bit Android availability on silicon. The availability of this port is the culmination of a broad architecture enablement program carried out by Linaro, ARM and the ARM partnership. 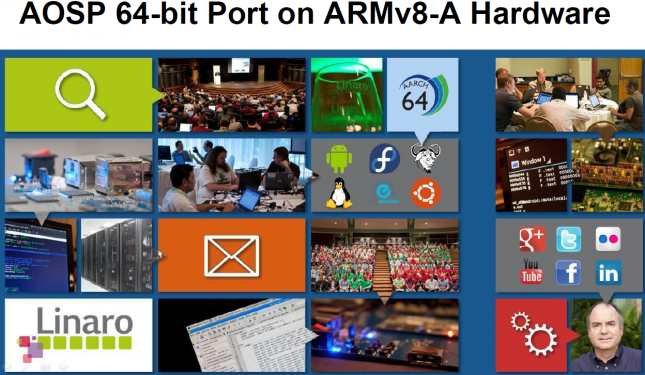 ARM partners now have access to a 64-bit and 32-bit AOSP file system, together with a broad range of supporting material including the ARMv8 Fast Models, open source toolchain from Linaro and supporting documentation. The Linaro 14.06 release includes a 64-bit primary/32-bit secondary binary image and source code based on the Linaro Stable Kernel (LSK) 3.10 for Android, compiled with GCC 4.9 and tested on both the ARMv8-A 64-bit hardware platform and ARMv8-A Fast Models. The AOSP port is based on the Open Master snapshot downloaded on June 1st with HDMI drivers loaded as modules. The release is built with the Android real-time (ART) compiler as the default virtual machine with the same source supporting both 32- and 64-bit user spaces on hardware and virtual platforms. Peripheral and advanced power management support plus several accelerations will not be available in this release, but will follow in future releases on a monthly cadence. Developers can find the release here: http://www.linaro.org/downloads/. 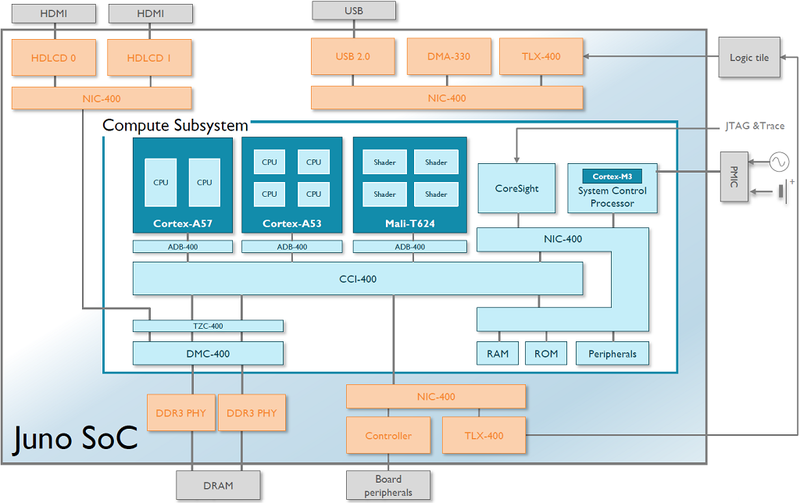 The ARMv8-A hardware development platform includes an SoC with a quad-core ARM Cortex-A53 CPU and dual-core ARM Cortex-A57 CPU in an ARM big.LITTLE processing configuration with a quad-core ARM Mali-T624 GPU linked via ARM CoreLink system IP. The development platform with its ARMv8-A software stack provides ARM software and silicon partners with a common foundation to accelerate their ARMv8-A software development. Further information about this platform is available from the ARM website here: www.arm.com/juno. Linaro is the place where engineers from the world’s leading technology companies define the future of Linux on ARM. The company is a collaborative engineering organization with over 200 engineers working on consolidating and optimizing open source software for the ARM architecture, including developer tools, the Linux kernel, ARM power management, and other software infrastructure. Linaro is distribution neutral: its goal is to provide the best software foundations to everyone, and to reduce non-differentiating and costly low level fragmentation. To ensure commercial quality software, Linaro’s work includes comprehensive test and validation on member hardware platforms. The majority of Linaro’s engineering work is open to all online. To find out more, please visit http://www.linaro.org.